Send us your blog entry submission regarding anything about archaeology and have your voice heard! Submissions should be sent to info@ontarioarchaeology.org as a .doc file. Blog entries should be read in a legible manner and formatting should be kept to a minimum. Please reference all photos appropriately. As the work for the project winds down for the summer, the time has come for another blog post. This summer has been a very productive time for us and we were able to make a great start with the collection. Personally, this has been a very rewarding project to be involved in. Being exposed to such an amazing and rich collection is really a dream come true for any archaeology student. My knowledge of Petun cultural artifacts has expanded immensely over the course of the summer. One of my favourite things about archaeology is the exhilaration that occurs when you find something that no one has touched for hundreds of years. This project definitely evoked the same feelings in me. Whenever I would start on a new site, and open a new box, I had no idea what I would encounter and I would inevitably come across some really amazing artifacts. For me the most interesting aspect of the collection is the evidence of localized production. Artifacts such as pre-form stone pipes, stone bead blanks, or a ceramic pipe stem with marks in the interior. For example, a pipe stem from the collection was broken in half at some point, and because of that we can see the impression of braided grass or twine which was used to form the stem. Aspects like this really let us visualize the way the pipe was made and even who had made it. The project is almost halfway completed and I am very happy that I was able to work on it for 6 weeks. We will also be posting some photos of interesting artifacts from the collection, so be sure to keep an eye out for those! From the Charles Garrad collection, which is currently being organized and examined by OAS summer student Katie Anderson. Other pieces from Charles' collection will soon be up on the OAS website, so stay tuned! This beautiful example of a human effigy pipe comes from the Connor-Rolling site, a contact era Tionontate (Petun) village from the‪ Collingwood‬ area. These types of pipes are called “pinch-face” pipes, and some scholars believe they represent shamans, or shamanistic power. The pipes are very standardized in their form and were made by Iroquoian speaking peoples across the Great Lakes region in the early 17th century. The distinctive shape of the mouth has been interpreted by some as representing the practice of sucking or blowing that were a part of healing ceremonies; ceremonial sucking tubes are often found on sites from this era. The increase in shamanic pipes coincides with, and was perhaps caused by, the influx of disease and societal changes brought on by European contact. The Toronto Chapter hosted a wonderful barbeque for their members and the executive board of the OAS. It was held on July 19th at the OAS head office, located at the Ashbridge Estate. Forecasts warned those who were outside that the day would be extremely hot, with temperatures reaching a high of 30 degrees Celsius. Fortunately, the trees surrounding the estate provided everyone with full coverage from the heat along with a refreshing breeze to keep cool. Tables were lined with various types of delicious food, ranging from salads to desserts and then to burgers and hot dogs! They were brought in by members and shared--eliciting hearty conversation and laughter. The OAS Executive Board also provided fruit and veggie trays to the event. Marti Latta gave a small tour, explaining the archaeological activity done on the property and the history of the location. A trench was dug towards the edge of the property and a well was discovered before it collapsed. According to historical documentation, the lake’s shore reached what is known to be the current Queen Street which borders one end of the property, providing some insight into the little boathouse located behind the Ashbridge family’s estate. Several members present at the event had participated in the excavation as well! Overall, it was a successful social filled with great food and interesting talks. It wouldn’t have been possible without Sylvia Teaves, the Clarence family, and the Gray family for organizing the event and helping the day run smoothly. Thank you to Lorie Harris who applied for permission to have the event on the property. Thank you to Mary Kapches of Bosley Real Estate who acquired the rental of the BBQ. Lastly, thank you to everyone who came out to have a good time! I know the Toronto Chapter is looking forward to hosting the same event next year! View our gallery for more pictures from the event. My name is Katie Anderson and I am one of the two summer students working for the Ontario Archaeology Society this summer. I graduated this month from Wilfrid Laurier University with a bachelors degree in North American Archaeology. In the fall I will be attending the University of York in England taking a Masters in Historical Archaeology. This summer my project is working on the Charles Garrad collection. This collection is made up of the assembled material that Garrad has excavated and collected over his career. The collection is made of Petun artifacts. The main goal of the project is to organize the collection, and the long-term goal is to transfer the collection to a museum, as the quality of the collections, and their significance to Ontario, is well-deserving of a permanent place that would benefit the pubic immensely. Garrad has been instrumental over the years in providing this material to researchers, and we want to help continue making these collections accessible, as there is much potential for future research. The collections are in excellent condition with the provenience information intact. The main focus of the project is updating the material to reflect current archival standards, including the use of non-gassing polyethylene bags. We are going through each site and removing the artifacts from their current means of storage and then putting them into new bags. As we are going through the collections we are also separating out the unique and interesting artifacts and photographing them so we have a record of the material that is easily accessible. I am really looking forward to carrying out this project this summer and can’t wait to see what else I will encounter and learn as I progress further into the collection. 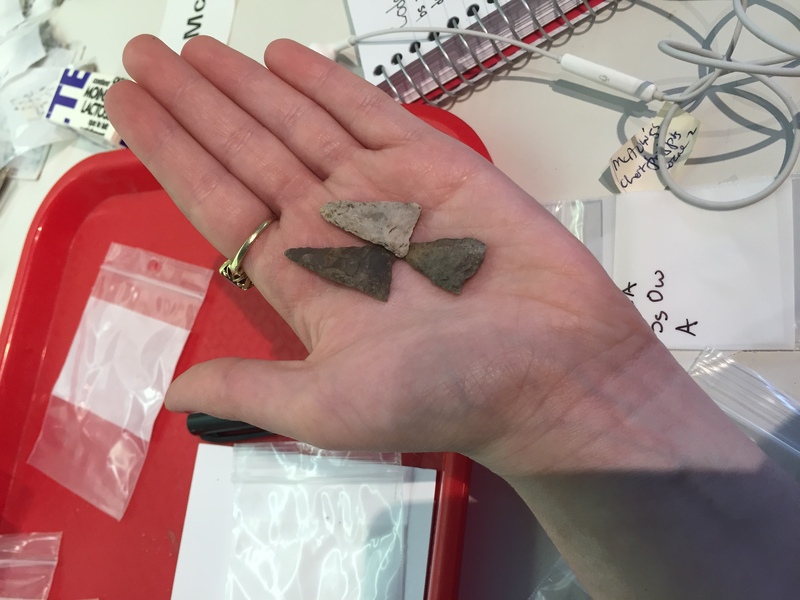 Through a grant program, the Ontario Archaeological Society was able to successfully hire two students to work on OAS related projects this summer. I was lucky to be invited again to continue the tasks from last year: developing the website, maximizing/updating social media platforms for archaeological outreach and aid in administration at the OAS head office. One of our accomplishments this year was to create a French version of the website. Viewers are able to click on the English/French buttons at the top of the page, and switch between either languages. With new pages being built constantly, some of the French pages are still undergoing translations but will soon be fully functional. Claire, the Director of Public Outreach, and I started exploring numerous design elements we felt could brighten the appeal of the website. The flashing images on the homepage were replaced with a slideshow of archaeological pictures, and the page now features colourful tables that update the vistiors on forums, blogs posts, and events! Many of the interactive elements on the website are now live such as: the forums, photo galleries, and OAS blog for the community. The OAS encourages you to participate in these new features where you’ll be able to meet others, and contribute to the ever-growing archaeological discipline in Ontario! Finally, as you may have noticed, when you try to go on the old website, it will redirect you here! This signifies the official closing of the old domain - now the OAS can fully utilize Wild Apricot and tackle the old and new challenges. There are still a great number of updates to complete before the end of summer. Hopefully, we’ll be able to finish the website by then so everyone can navigate with no difficulties! Similarly, work at the head office has been just as busy. One of the major projects the past few weeks is preparing a compilation of stats for the PHO Grant; with the deadline in the upcoming week. Unfortunately, we keep running into problems, so Lorie (the Executive Director) and I have been pulling all our hair out, mostly due to the amount of math our brains are not used to doing! However, I’m happy to report that at least 85% of it is now completed, and the week of the grant work won’t be as stressful for us. Whenever we want to de-stress, we would have a nice chat while filing or updating documents. All in all, I’m glad to be back for another great summer at both the head offices of the OAS and ASI. I am excited for what surprises the OAS will bring this summer for the board, its members, the general public, and me!